Douchebag Workout 2 is one of the funniest game has ever made. And when it comes to using the cheats in the game, it gets really awesome. Hello guys, in this post you’ll find the latest Douchebag Workout 2 Cheats which you can apply in the game to get help. What is Douchebag Workout 2? How to Apply the Cheat Codes? Douchebag Workout 2 is an online funny game. It is all about being a douchebag and building your body, muscle in the gym. In the game, you can build your body muscles, pimping up your crib, tuning up your ride and scoring chicks in the club. And you can do a lot of things in the game. This game has many levels in it. The more level you complete, the game gets more hilarious. So, if you are a lazy person and want to play some funny game, Douchebag Workout 2 is for you. This game has many parts. There are different parts like Douchebag Life, Douchebags Chick and Douchebag Beach Club. In each part, you get a limited time to complete. The main goal of this game is to build your social life stronger. If you are a shy person, you can train yourself with the game to build more confidence in yourself. In the game, you have to complete tasks to enter in the next level. But sometimes, the tasks get really hard to complete. Thanks to the Douchebag Workout 2 Cheats that you can apply and complete the tasks easily. Isn’t that cool? Each cheat code has its own function. You can apply them during the game to activate the cheat codes. First of all, visit the game by clicking the link below. 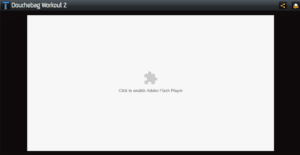 You’ll see a prompt page to run Adobe Flash Player. Click and Allow the flash player. The game will start. Click ‘Start’ to play the game. Now, just type the codes to activate them. You can apply the codes during the game also. So guys, hope you’ll enjoy the Douchebag Workout 2 Cheats. If you liked the cheats, you can share it with your friends and family. You can also comment your thoughts down in the comment section below.